Zalora.com.my, Malaysia's fastest growing online shopping destination celebrated the recent arrival of River Island to the e-commerce hub's extensive catalog of fashion labels. The party was held at Zouk Club KL and was attended by Mr. Giulio Xiloyannis, Director of Buying and Marketing for Zalora Malaysia as well as Malaysian celebrities, members of the media and Zalora's top customers. Natalie Kniese, the host for the evening, kept the crowd excited as they eagerly anticipated the London-based High Street fashion brand's presentation. 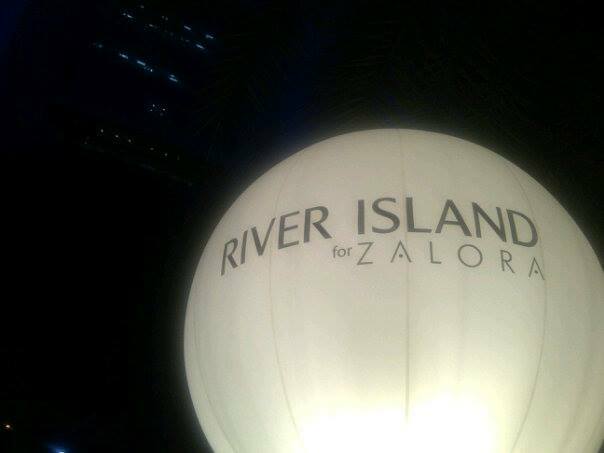 The River Island Autumn Winter 2013 fashion show highlighted the party and further fueled guests' enthusiasm for the brand's entrance into Malaysia through Zalora. After the show, guests were encouraged to explore the Blackberry QR panels, which enable Blackberry users to purchase looks from the collection with a simple scan of a QR code. Each panel is fitted with images of the collections, accompanied by a QR code next to the item. This partnership with Blackberry further demonstrates Zalora's proficiency in making technology an effective method for retail success. In addition to Blackberry, River Island launch saw support from CIMB Bank, SUB International Beauty School, A Cut Above, TGV Cinemas and Strip that ensured a rewarding evening for all in celebration of fashion. Known for its stylish and affordable fashion as well as the unique touches brought to its collection; River Island is a label that stands out from the rest of the High Street. Loved for its great going-out looks, amazing denim and fabulous shoes and bags, River Island is the go-to place for a complete head-to-toe look. With the label's foray into Malaysia and South East Asia through Zalora, River Island fans can rejoice, as the High Street hit is available at Zalora.com.my. Zalora's team is also working on bringing on board the Rihanna x River Island collection, which would be set to launch in coming months. Zalora is Malaysia's one-stop destination for fashion and footwear. Bringing insight to global trends, Zalora is home to hundreds of brands and thousands of products ranging from international labels, high-end local designers and homegrown high street fashion brands. Constantly adding fabulous new styles with a host of trend tips and fashion advice, Zalora enables shoppers to experience easy and fun online shopping. With a full range of services, Zalora promises an easy, speedy, value-for-money experience by offering free delivery, fast shipping and safe shopping.